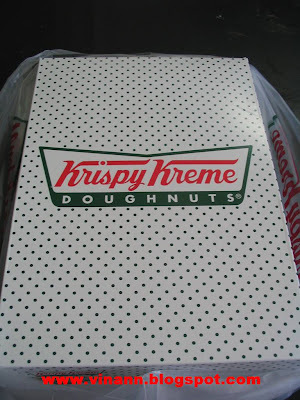 i have been long time heard about this Krispy kreme donuts. people said it's the original donuts from USA. while other brand like J Co (my favourites, an Indonesian Francais) is copying from Krispy Kreme. in my mind, the original donuts must be a better one and taste good one. Since it's just launched on Monday, i was expecting huge crowd lining up and long Q.
today is 1st May, Labour Day... i finally have the chances to buy it. arriving at Time Square about 12.00pm. oh, no long Q, no huge crowd. the renovation, packaging of the outlet is seem like other normal donuts shop. i did not feel any extra special on it. At J Co, it's the totally opposites from KK. The machine is put at the back, while the staff who making the donuts or adding the cream is right in front of lining Q. The Menu display for KK is just normal... guess KK is emphasis on the "original". While for J Co they have crown donuts... which introduce what's inside. im lazy to de-tour to takes the big round for a better, n wider access to KK front main door, and immediate im up, i take the "small lorong" towards the side door. i did not managed to see what's inside and also did not care what's inside. just walks toward to the side door. oh, so less people is lining... it's just 12.00pm. after brought the half dozen, i use the same way im coming in. Now i can see what's inside the rack which covered by green cover with KK logo on it. Besides that, my initial thought was "IS IT THE OVERNIGHT DONUTS?" YESTERDAY DONUTS? why the donuts being left outside? is it really due to lack of space to cool down the donuts?